Altough it is not useable now, with its natural harbor also a fiord this city has become a doorway to World for Ancient Lycia. As the famous Roman Historian Livius wrote: “caput gentis Lycia” with this title Patara was the capital of Lycia Union at B.C. 167/168. In the light of current information we have today, Patara is known to be first settled around B.C. 3000 and it was the last city that Hittite King Tuthaliya (B.C. 1300) visited on his Lukka expedition. Patara has also been the capital of both Lycia Province built in Emperor Claudius period (A.D 43) and Lycia Pamphylia Province built by Emperor Vespasian (A.D 73/74). With its harbor this city held a big role on political and economic history of whole area, also being the center of “Apollon from Lycia” prophecy and by the fact that Santa Clause “St. Nikolaos” was born and lived in here is supporting Patara’s importance on religious history too. The arch that symbolising city’s monumental entry with with its height of 10 meters is emphesising Patara’s glory. It is known by the writing on it as “From Metropolis of Lycia Pamphylia Province Mettius Modestus” this is an Arch of Honor built around A.D. 100. Entered by this monumental door, this city is one of the most glorious ancient cities of Anatolia with its still standing five bathhouses, thirteen churches, storehouse by harbor (horreum), many temple graves, stadium and many other buildings. As one of the most important ports of the ancient Lycia, Patara is a heavenly place that enjoys nature’s generosity. Patara, with its silt sand, which reminds one of a desert, its clean and clear waters, ancient city, and world-renownd beach, hosts thousands of tourists every year. Gelemis village and the ancient city of Patara lie hand in hand. The ancient city, Iocated right behind the tong beach, which extends for 18 km, includes an amphiteater, aqueducts, mausoleums, tombs, and a church, which were discovered after many archaeotogical excavations. The newly restored amphitheater dates to 2 B.C. and has a capacity to hold approximately ten thousand spectators. A littte farther in the distance, you can see the ruins of the lighthouse, which is thought to be the first Iigthouse of the world. However, a great part of the city is buried under the sand carried from one place to another by the strong winds. Acacia trees and other plants that were planted as part of a project that aimed to prevent the free transportation of sand add a special beauty to the region, white deep pink colored oleander ftowers and pine trees cornplemcnt Patara’s natural beauty. The road to Patara Beach passes through the ancient city. Patara, a city with its back on a high mountain that separates a wide valley from the sea, was the place where the Ancient Greeks lit their first fire after coming to Asia Minor. Believed to have been foundod by Pataros, son of the Greek God Apollo and the nymph Lykia, Patara was also the birth place of the Apotto sect. According to Lycian rnythology, Leto gave birth to her twins Apollo and Arternis on this land and gave them their first bath in the Xanthos (called as Esen today) Creek. For this reason, the creck is considered holy according to Christian belief. Moreover, St. Nicholas, one of the greatest Christian saints who is also known as Santa Claus, was born in the third century B.C. in Patara according to Byzantine records. Only two km coast line of Patara is used as a beach. Therefore, there is only a single kiosk that sells refreshments and food. Since alI sides of the beach are open to the sea, huge waves always pound the shore in Patara. With a length of 18 km, Patara is the longest heach of Turkey with its narrowest part 280 m and widest part almost 1,500 m. It is also listed by the Ministry of Environment as a National Park and protected region. Patara’s secluded beach area is also a breeding ground of Loggerhead Marine Turtles Caretta caretta. Persons who go through a sand cure in this beach, which has a type ot microorganism which used to be an indicator of a clean sea thousands of years ago, are freed lrom physical pain and aches. Patara is the activity center of Kas and Kalkan. Visitors come here to enjoy water sports, canoe trips, hikes in the nature, and horseback and motor safari tours in the sand dunes. We participated first in a horseback safari and then a canoe trip. in the history of early Christianity, Patara was an important episcopal center, and a busy port during the Roman period, where as today, Patara port is covered with sand dunes. The sand brought by the winds began to fill the port, which is 400 m wide and 1,600 m deep, and soon, the city became almost invisible. Indeed, the wind here blows the sand so fiercely that it is extremely difficult to keep your eyes open. One can tour the sand dunes the coastal line and the ancient city on Hafringer breed horses, provided by the tour operator. Canoe trips cover crossing the Esen Creek, which starts from the Saklikent Canyon with one branch passing through Kinik. The canoes resembles those used by American lndians. Esen Creek starts running under the bridge in Kinik and travels for 16 km before reaching Cayagzi (River Mouth), and it takes almost four hours to travel by canoe. 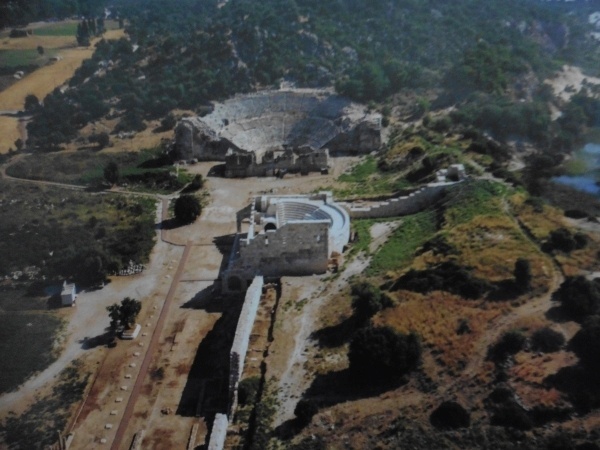 lf you go to Kinik for a canoe trip, you should also visit the ancient city of Xanthos. The most striking historical edifice in this ancient city that had maintained its independence until the Persian sovereigny is the monument of war. This 8.87 meteý high monument consists of a massive pedestal carved in rocks and a small tomb chamber with four sides decorated with friezes. The reliefs in this chamber covered with a lid were plundered and taken to London in 1842 by British adventurer Sir Charles Fellows and the original pieces were replaced by copies made of plaster. The nearby Harpies Tomb gets its name from the mythological harpies half birds, half women creatures carrying away dead children to the underworld.